A mountain brigade of the Russian Central Military District has been equipped with a modernized version of the Tigr (Tiger) multipurpose all-terrain infantry mobility vehicles. More than thirty special purpose all-terrain infantry mobility vehicles Tigr-M SpN have been put on service at a mountain brigade of the Russian Central Military District, its press service reported on Tuesday, according to Russia's RIA Novosti news agency. The press service said that servicemen are currently practicing driving the new vehicles in the run-up to drills which will be held in September, where they will perform a series of combat training missions on shooting ranges of the Central Military District. 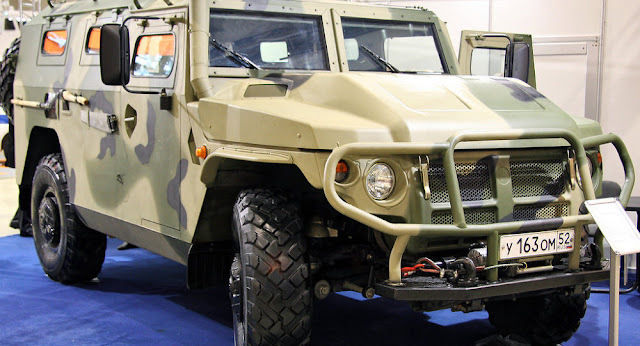 According to the press service, the Tigr-M SpN vehicles are mainly designed for reconnaissance and patrol purposes, as well as for protecting convoys and supporting army units. The modernized Tigr features a new diesel engine, a new armored hood, an air filter installation, an increase in the number of rear passenger seats (from eight to nine) and the replacement of the bicuspid rear hatch with a large square hatch. "In addition, the vehicle is equipped with automatically regulated tire pressure, an automatic fire suppression system, a starting preheater and a self-recovery winch," the press service said.